Amazon.com: Tourism in Madagascar has leapt forward as a result of the cartoon film and media coverage of its culture and wildlife. The tourism infrastructure has been improved, with better roads and new luxury hotels, without compromising the focus on ecotourism. The world's fourth largest island now appeals to a broad spectrum of visitors, from those seeking hard adventure to others content to enjoy the beautiful beaches and accessible national parks. Beautifully illustrated with full color photographs throughout, Madagascar Wildlife is a celebration of the unique fauna of a remarkable island and the perfect accompaniment to Bradt’s popular general travel guide, Madagascar. The guide is ideal for natural history enthusiasts and travelers alike, and the third edition has been fully revised to include new species. For example, there are 20 more species of lemur than in the last edition, and the number of known frog species has nearly doubled. Also includes information on ecology and conservation; and photographic tips. You are invited to roam the island nation of Madagascar in search of 101 species and sub-species of lemurs - those captivating primates found nowhere else on Earth. 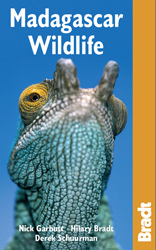 This expedition takes place in the third edition of Lemurs of Madagascar, from "The Tropical Field Guide series of Conservation International", now completely revised from the second edition in 2006. 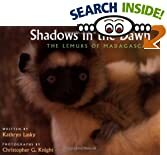 The most current and authoritative book on the topic, Lemurs of Madagascar presents a wealth of new information on every aspect of the biogeography, ecology and conservation of lemurs, with chapters reviewing and summarizing information on the geological history of Madagascar, the origin of lemurs, the extinct lemurs, the history of the discovery and study of living lemurs, and the conservation status of the lemurs and the threats to their existence. I have come to the Marojejy National Park with my graduate student Mireya Mayor to be the first to capture, weigh, and take genetic samples from the Silky Sifaka. These white Sifakas have been classified as a subspecies, but Mireya thinks that each of the 4 eastern rainforest Sifakas might be its own species. She is beginning her dissertation to capture each of these Sifakas and take samples to examine their genetics, as well as to take measurements. The steep summit of Mount Marojejy looms over us, as if daring us to climb. The mammals that inhabit Madagascar are among the most extraordinary in the world. This portable guide offers a full survey and classification of all the Malagasy mammals, both endemic and introduced, including many new species only recently identified. With vivid color photographs, line illustrations, and maps, Mammals of Madagascar: A Complete Guide is an essential volume for any tourist or biologist who visits the island—or wishes to. The guide provides descriptions of the physical and behavioral characteristics of each species as well as information about habitat and distribution. To further aid identification, the book lists top mammal-watching sites in the rainforests, deciduous forests, and spiny forest areas. Streamlined and completely updated, this book replaces Nick Garbutt’s classic earlier work, Mammals of Madagascar, and takes its place as the definitive guide to the mammals of the world’s fourth-largest island. A stunning work! The highly successful "Globetrotter Travel Series", which includes Travel Guides, Travel Maps, Road Atlases, Best Of Pocket Guides and In Your Pocket Language Guides, presently covers more than 90 destinations worldwide. The Packs are excellent value, including both a guidebook and a softcover version of the fold-out Globetrotter map of the region, in a printed plastic wallet. The handy pocket-size guide is packed with useful information, tips and recommendations, accompanied by color photographs, charts and maps for the first-time traveller who wants to experience the major highlights that Madagascar has to offer. The fold-out map of Madagascar is ideal for tourists and visitors. Following in the format of Sasol Birds of Southern Africa, this guide presents all the birds of Madagascar and the other Indian Ocean islands (Seychelles, Reunion, Mauritius and Mascarenes), a great many species of which are endemic to these islands. In field guide form, this text presents concise descriptions of each species, highlighting diagnostic features for ease of identification. Differences between sexes and plumages are discussed as well as the status of the bird, its habitat and call. Distribution maps accompany each entry. The birds are illustrated in full color and where necessary are depicted in all plumages relevant to identification (male, female and immature). In-flight illustrations present the bird from above and below, providing comprehensive coverage of the birds in the field. Amazon.com: This beautiful book is a photographic guide to the birds of Madagascar--260 species, including 108 that are endemic to the island. The book details the plumages, vocalizations, habitat and behavior, range, status, and habitat zones of each species. "Where to watch" advice and a gazetteer to birdwatching locations provide invaluable information for visitors planning to see the avifauna of Malagasy. Amazon.com: Experience Malagasy magic with us. Spot lemurs in lush rainforest, dance the salegy with locals or explore remote highland villages. Though only a short sail from the mainland, Madagascar is a truly unique African destination. Idyllic beaches, rain forests and parched deserts, lemurs and chameleons, the woodcarvers of Zafimaniry villages, the relaxed tropical ambience of Anjouan, the bustling flower market of Antananarivo, pirogues cruising the Tsiribihina River - Madagascar and the Comoros boast attractions as diverse as they are appealing. This guide is your essential companion - the only one to cover both destinations. Amazon.com: Lying some 250 miles off the east coast of Africa, Madagascar is the world's fourth-largest island. It is quite unlike the neighboring continent, and, for that matter, quite unlike any other landmass on the planet. Its plant life is almost wholly endemic: eight out of 10 plants there grow naturally only on Madagascar, and it has an entire ecosystem, the spiny desert, that is found nowhere else on earth. Many of its animal species, too, seem to have emerged from some evolutionary track that runs parallel to the rest of the world's; here can be found lemurs that will fit into a human palm, dwarf hippos, giant chameleons, and other rarities. These plants and animals constitute an extraordinary diversity, writes science journalist Peter Tyson in this engaging book, and the island's richness of life has long intrigued scientists, who have proposed several theories to explain it. Those scientists, some of whom Tyson profiles at work in the field, are racing against time to catalog island life before it disappears, for Madagascar's human population is rapidly growing, and with that growth, the island's forests and other habitats are falling. The urgency may abate, Tyson writes, with guarded optimism, now that the island's current president has proposed that all of Madagascar be considered as a United Nations World Heritage Site, which would help provide funds to prevent further loss of habitat and diversity. Though this proposal is controversial, Tyson makes a good case for why it should be taken up--and he shows just how high the stakes are. Throughout his narrative, Tyson mixes scientific reportage with a nicely rendered travelogue that guides readers across the island while outlining key concepts of island biogeography and conservation biology. His book is a worthy companion to David Quammen's Song of the Dodo, and valuable reading for anyone concerned with the world environment. --Gregory McNamee --This text refers to the Hardcover edition. Amazon.com: Here is the riveting tale of Gerald Durrell's adventures and misadventures in the enchanted forests of Madagascar, in search of the elusive Aye-aye. Once thought to be extinct, the Aye-aye, the beast with the magic finger, still lurks, though in fast dwindling numbers, in the forests of Madagascar. Durrell's mission to help save this strange creature turns into a madcap journey in which you will meet not only the enigmatic Aye-aye, but the catlike Fosa, the Flat-tailed tortoise, the Gentle lemurs of Lac Alaotra, and the Malagasy chameleons, among others. Truly nothing escapes Durrell's sharp eye, whether he is describing the great zoma (market), the village dances, the treacherous bridges and river crossings, the strange foods and stranger music, or the vagaries of local officialdom. As the San Francisco Chronicle noted, "It is impossible for Gerald Durrell to write anything that is less than exuberant, eccentric, and amusing." And in his account of this "rescue mission", Durrell is, quite simply, at his superb best. In this lavishly illustrated book, Ronald A. Lake shares his photographs of the life and landscapes of Madagascar from a trip taken in September of 2007 with a group from the Wildlife Conservation Society (WCS). These images of rural life and city streets, of exotic lemurs and ancient baobabs, of rainforest and plains, reveal his personal glimpses of an extraordinary land and its people, as well as the many economic and social challenges it faces.